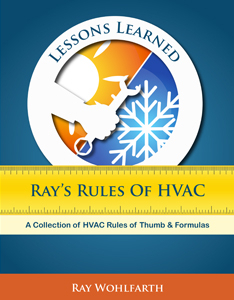 Congratulations to @RayWohlfarth on his new book: Lessons Learned: Ray's Rules of HVAC: A Collection of HVAC Rules of Thumb and Formulas Thanks for the tips, Ray! Mine should be showing up today! @RayWohlfarth the book is awesome! It will be a staple and extremely valuable resource for me! I will be buying some more to give out! Thanks @kevinj_4 and @Mike_Sheppard I appreciate it. Got it......kinda skimmed thru it. There is a lot of info crammed in there!! This should be good for sales as well as troubleshooting. Many times you want to be sure of pipe sizes and such on a sales or service call. > This should be good for sales as well as troubleshooting. > Many times you want to be sure of pipe sizes and such on a sales or service call. Totally agreed! It happens all the time. Thanks @Mike_Sheppard I appreciate it.